I had the greatest role models in my life. Teaching me what was important and what wasn’t. When I look back, these lessons in life meant more to me as I got older. I’m sure it must have been frustrating for them seeing me make my mistakes. If I could go back and redo things, I sure would pay more attention to what they wanted me do and do things the way I was told. My role models were my mother and my grandmother. These two women lived in Europe during Second World War. They very rarely spoke about the those times but I could see the pain when on rare occasion they did share some of the stories. My Baba often said, “If I could speak better English, I could write a book this thick.” As she gestured to a height that was about 12 inches high. I really don’t know why she didn’t write things down because her English was as good as mine. She was a very smart and tough little women to survive what she did and then come to a completely foreign country, not speaking the language to start life all over again. They imparted on me their love of cooking. They brought with them traditions be cannot be replaced. These things live on in my heart everyday with the memories they created, now that are both are gone. I try to pass these things on to my children and grandchildren hoping some day they will do the same. 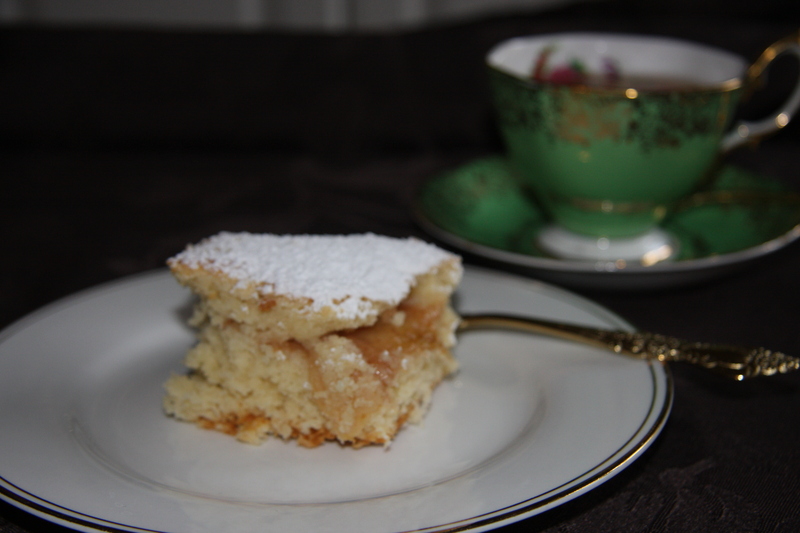 Here is a recipe that Baba use to make, that my son well remembers because he just recently asked for it. 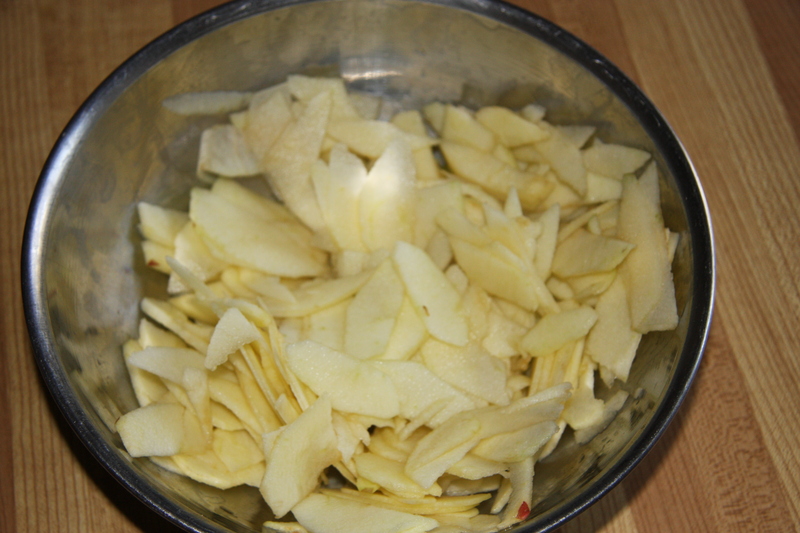 Peel and core 4-5-6 apples. 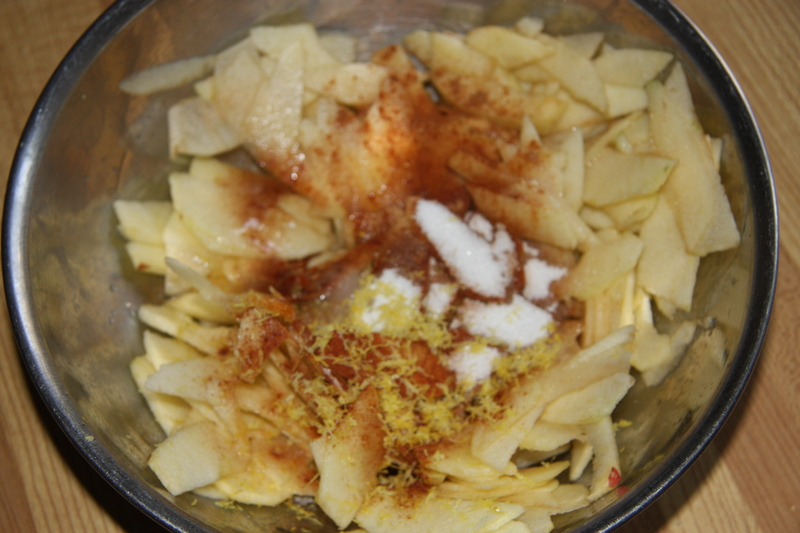 Add 1/2-3/4 cup of sugar, 2-3 tablespoons of cinnamon, 1/2-1 lemon rind and its juice. Mix. You can leave this overnight. Into another bowl add 1/2 lb. of butter and 1 cup sugar. Mix until well blended. 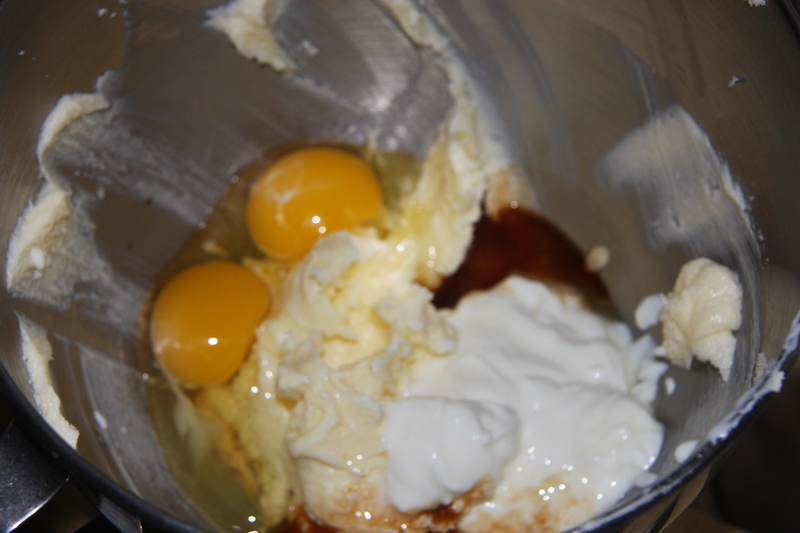 Next add 2 eggs, 3 tablespoons of sour cream and 1 tablespoon of lemon juice or even vanilla. Mix well. 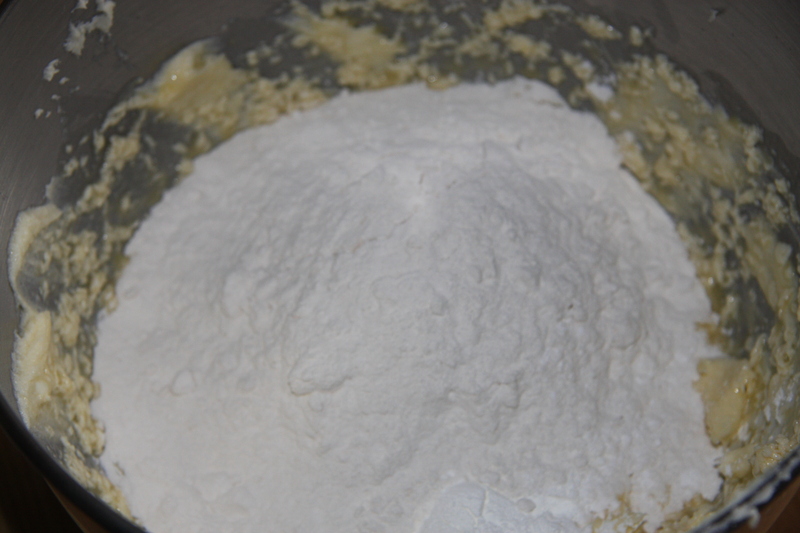 Add 2 cups of flour, 1 tablespoon of baking powder, pinch of salt and mix well. Dough will be sticky but firm. 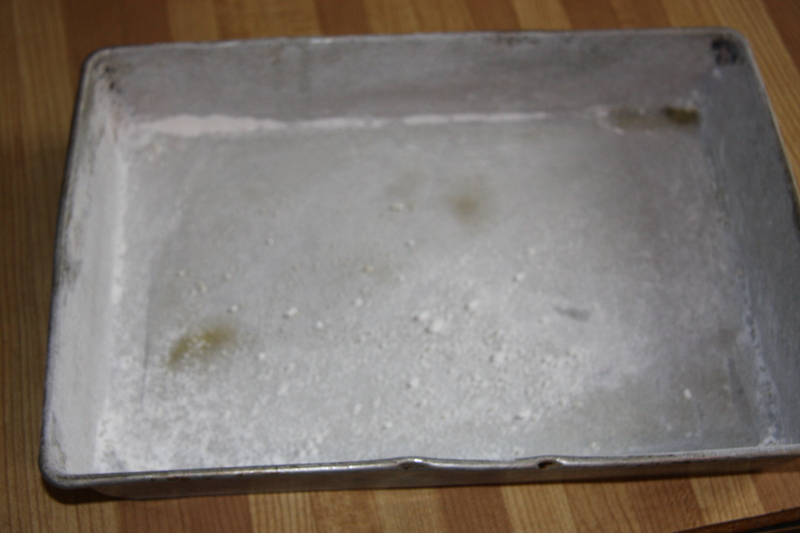 Grease and flour a 9×13 inch pan. 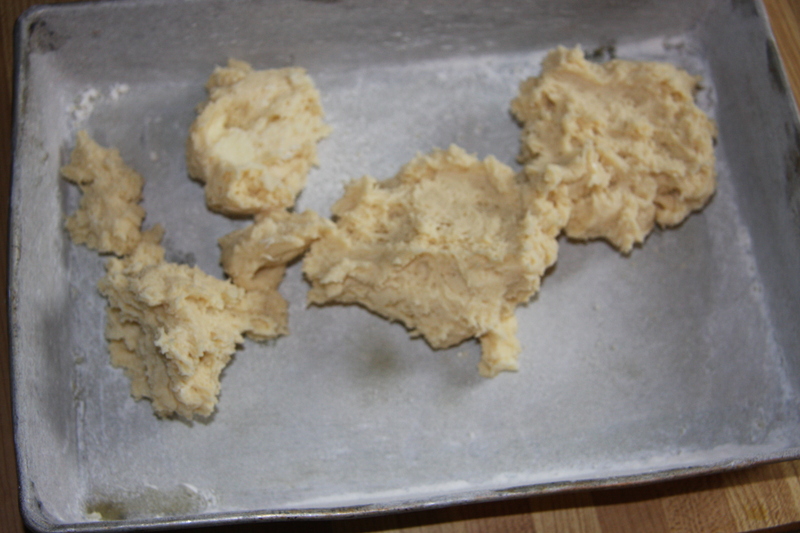 Then drop onto the pan, clumps of dough, about half. 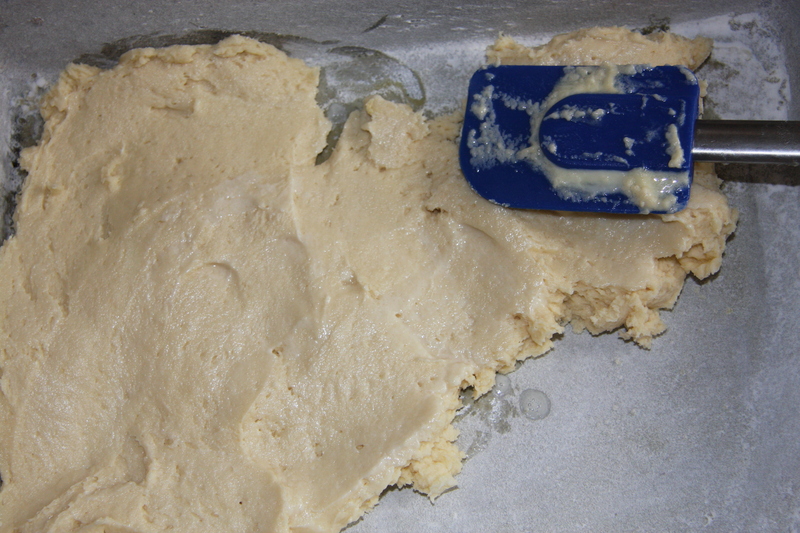 With a spatula or spoon that has been continually dipped in hot water, slowly spread the dough to fit the pan. 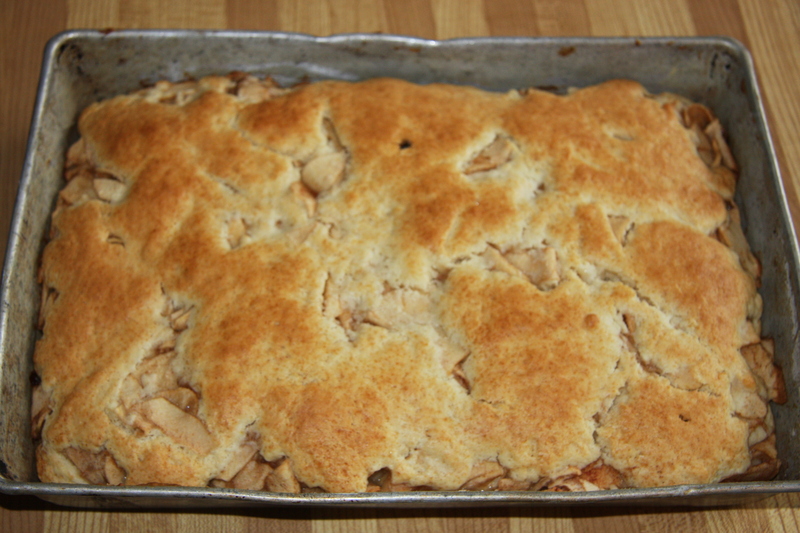 My apples sat in the refrigerator overnight so I drained a lot of the liquid but I also added about 1/2 cup of flour. This is to prevent the apples producing more liquid and making your dough soggy. 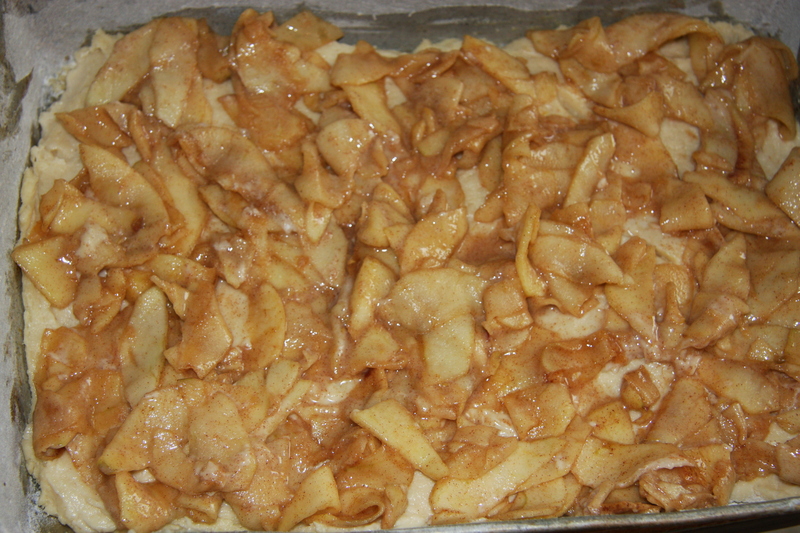 Next place the apples on the dough and spread them to cover the dough. 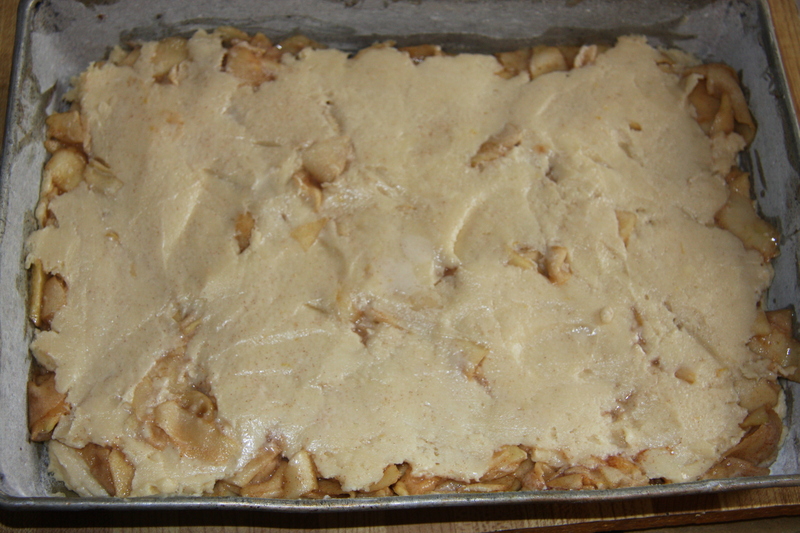 With the other half of the dough, drop it by the spoonful on top of the apples and spread it the same way as the bottom half. Bake in the oven for approximately 30 minutes. 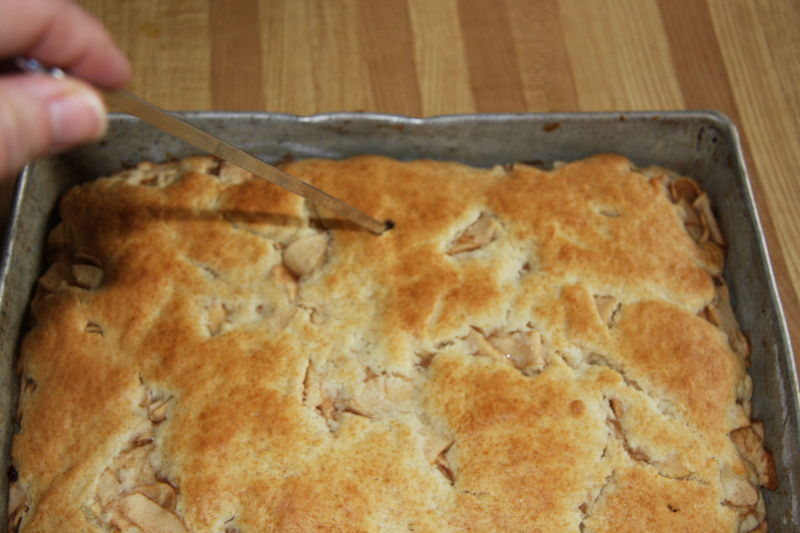 When it is nicely golden remove from the oven and check with a toothpick. I use a skewer. Look at this skewer, it is clean, so I know my cake is ready. I use to use a toothpick but this is a trick I learned in Ireland cooking with a Cordon Bleu chef. Ta Da! Let it cool. Cut yourself a piece and sprinkle it with icing sugar. Pour yourself a cup of tea and enjoy! This cake freezes well. Combine butter and sugar, beat until well combined. Add the eggs, sour cream, lemon rind and lemon juice, beat some more. With all this beating I use a Mix Master. Boy, am I dating myself . It is sssooo much faster. 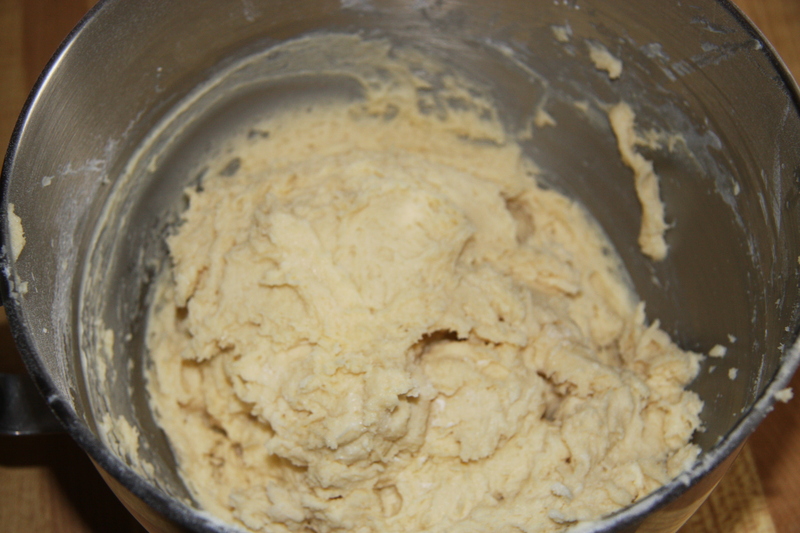 Next add the flour and baking powder. 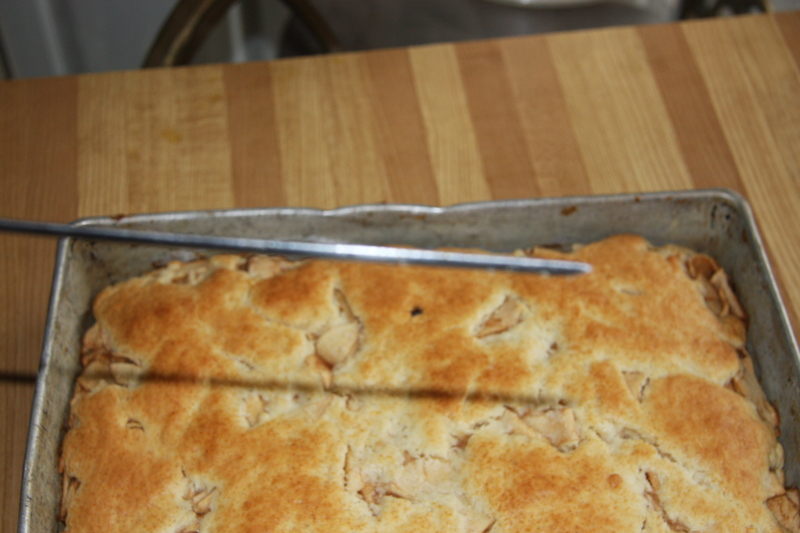 When all the ingredients are well combined, divide the dough in 1/2 and pat it into the pan. 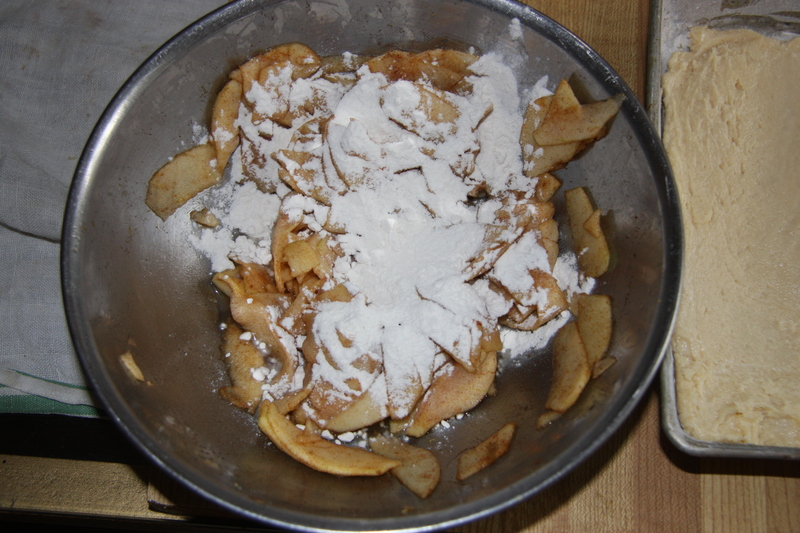 Next place the apples on top and finish off by dropping dough on top of the apples then spreading it out with a hot and wet spatula. Bake in a pre heated oven for approximately 30 minutes or until golden. Cool and freeze or cool and sprinkle with icing sugar.